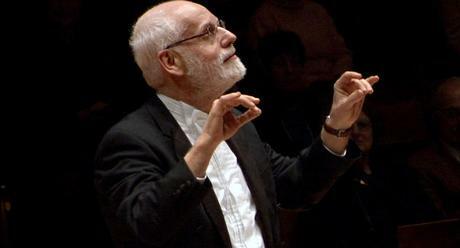 Conductor Ton Koopman gives a history lesson at the Kennedy Center. this week at the Kennedy Center. Photo © 2017 Berlin Philharmonic for the digital concert hall. It’s not every week that a symphony orchestra springs a trio of premieres on its subscription audience, but that's what happened on Friday morning at the Kennedy Center in Washington D.C. The ensemble was the National Symphony Orchestra and the conductor of said concerts was Ton Koopman. The Amsterdam-based organist, harpsichordist and scholar remains a legend in the field of period and historically informed performance. Mr. Koopman used this concert program as a teaching tool, leading the audience through some of the lesser-known creations of the 18th century and showing how these forgotten works are hugely influential on the music of the modern era. Jean-Féry Rebel, Jean-Philippe Rameau and Carl Philip Emmanuel Bach are hardly household names today. But, all were essential in the key transition from the flourishes of the Baroque era to the more rigid structures of the Classical period. The latter was represented in the second half by a pair of works by Mozart and Haydn, rollicking, humorous works that showed that "classical" does not always equal "serious." That approach continued with the Rameau, a suite from his successful opera Les Indes Galantes. Again it was the performance practice here that made the players sound like an ensemble transformed, as they evoked Rameau’s exotic travelogue in a series of complex and courtly dances. Rameau was attempting a kind of speculative armchair tourism in this opera. In each of these sparkling dances, one could only marvel at the depth of invention in each musical turn of phrase. Of the four sons of Johann Sebastian Bach, it was Carl Philipp Emanuel who was at the forefront of the transition toward the classical style. The Symphony in G chosen here is from a late set of Hamburg symphonies. In it, Bach flawlessly integrated the woodwinds into the lines played by the strings. Mr. Koopman and the orchestra injected a sense of bold adventure and exploration into these three movements. The fast finale with its sonorous horn parts and sprightly textures raced to the finish in an exciting manner. With the Seranata Notturna by Mozart, the concert moved wholly into the classical period. This charming work pitted a group of soloists against the rest of the orchestra playing tutti. In the last Rondo, everybody got an opportunity to show their stuff. Common instruments like the violins led the procession of solos at each turn of the rondo. The double bass and timpani got turns too. The latter had a playful expression of bewilderment on his face at the opportunity to go wild for a few bars. Mr. Koopman played along with the festivities, acting shocked when the pair of cellists in front of him “insisted” on having the last word before the final chords. Haydn’s Symphony No. 83 is known as "La Poule" ("the Hen") for a scraping, clucking figure that permeates the first movement. As one of the symphonies that Haydn published for a series of concerts in Paris in the 1780/, it shows the then 53-year old Haydn at the height of his very considerable powers. This was a period where the composer was a whirlwind of active, writing music, producing operas and performing away from his home base, the court of Prince Esterházy. its presence on the program brought the evolution of musical style full circle back to that city, and it's exuberant conquer of a dark minor key with a transition into bold bright light brought this afternoon musicale to a joyful lose.